I haven't played a ton of skateboarding games in my life, but I was a fan of Skate 3 (even if the co-op was so-so). 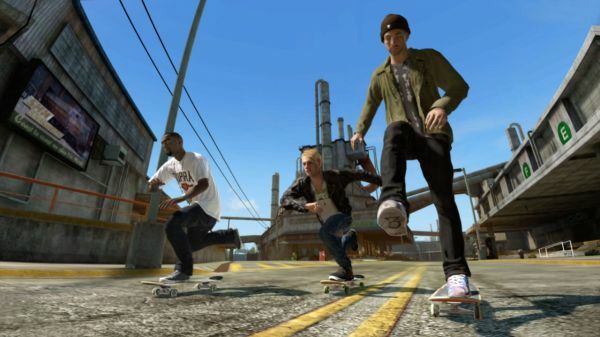 I'm also not the only one that would love to see a Skate 4 despite the fact the development team behind those games is now long since scattered to the wind. At least I'll be able to grind all over again now that Skate 3 has been added to the Xbox One Backwards Compatibility list. The biggest feature of the title was the ability to create your own custom skate park, either alone or with friends. Doing tricks around the park and just having fun is perhaps the best part of the co-op experience, as the rest of the time, you'll likely be yelling at one another and asking "why can't you just do that trick?!" See, outside of just free skating around, the rest of the Skate 3's co-op is all about tackling the in-game challenges as a group. Fun in theory, poor in practice as each and every one of your skate crew has to complete the challenge on their own. If you have trouble performing an anchor grind in to an olley into a beni-hana, but everyone else can pull it off flawlessly, then you all have to keep repeating the challenge until you get it right. It's a good way to test some friendships. Despite that, Skate 3 is still a blast to play. If you don't own the title, then check Major Nelson's Twitter account around 2:00 PM Eastern today, Thursday, as he'll be giving out some codes for the game. Page created in 0.3113 seconds.